‘Squizzy’ Taylor, Melbourne Criminal 1888-1927. Joseph Leslie Theodore (Squizzy) Taylor (1888-1927) criminal, was born on 29 June 1888 at Brighton, Victoria, son of Benjamin Isaiah Taylor, coachmaker, and his wife Rosina, née Jones, both Victorian born. The family moved to Richmond and Leslie tried to make a career as a jockey on the inner city pony circuit where he came to the notice of the police. At 18 he was convicted of assault. Between 1913 and 1916 Taylor was linked to several more violent crimes including the murder and robbery of Arthur Trotter, a commercial traveller, the burglary of the Melbourne Trades Hall, in which a police constable was killed, and the murder of William Patrick Haines, a driver who refused to participate in the hold-up of a bank manager at Bulleen. Taylor was tried for the murder of Haines and found not guilty. Although rarely convicted after 1917, Taylor remained a key figure in an increasingly violent and wealthy underworld. His income came from armed robbery, prostitution, the sale of illegal liquor and drugs, as well as from race-fixing and protection rackets. With Paddy Boardman, he conducted an efficient and lucrative business in rigging juries. Squizzy is the bloke on the crutches. 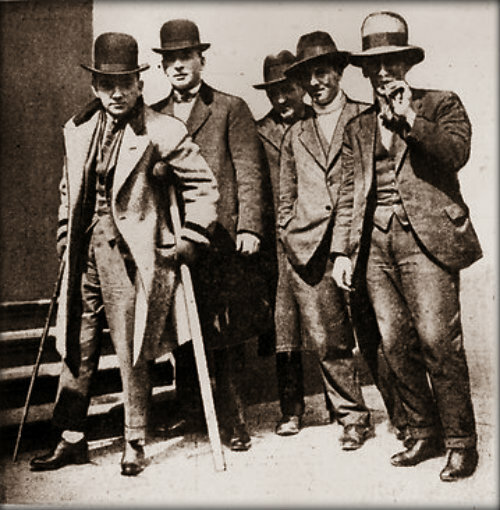 Disputes between rival racketeers resulted in the ‘Fitzroy vendetta’ of 1919 in which several men were shot. Taylor was among the principal figures in these gangland shootings. Charged under warrant in 1921 with theft from a city bond store, he eluded the police for twelve months but gave himself up in 1922. He was acquitted. In 1923 the bank-manager Thomas Berriman was robbed and murdered at Glenferrie railway station. Angus Murray and Richard Buckley were charged with the murder. Taylor faced charges of aiding and abetting the crime, and of assisting Murray’s escape from Pentridge prison. On both counts he again escaped conviction. He was eventually found guilty of harbouring Murray and sentenced to six months imprisonment. n 1923 they had co-starred in a film about Taylor’s life, Riding to Win; banned by the Victorian censor, it was released in Brisbane in 1925 as Bound to Win. On his release from prison Taylor continued thieving, but concentrated his efforts on race-tracks. Involved in selling cocaine, he came into conflict with several Sydney gangsters. He was wounded in a gunfight with one of them, John ‘Snowy’ Cutmore, at a house in Barkly Street, Carlton, and died in St Vincent’s Hospital, Fitzroy, on 27 October 1927. Survived by his wife and by a daughter of his first marriage, Taylor was buried with Anglican rites in Brighton cemetery. ‘Squizzy’ was a colourful figure in the drinking and gambling clubs of Fitzroy, Richmond and Carlton. A dapper little man who dressed loudly, he strutted through the courts, race-courses and theatres. While hiding from the police, he wrote letters and verse to the press. Yet he had few redeeming qualities. Taylor won lasting notoriety by imitating the style of American bootleggers; he never matched their influence or immunity from the law, and at the time of his death could no longer command fear or loyalty from the underworld. via Biography – Joseph Leslie (Squizzy) Taylor – Australian Dictionary of Biography. This entry was posted in HISTORY AND PEOPLE and tagged australia, crime. Bookmark the permalink. ← On location in Iceland with my iPhone.